It’s taken me 3 1/2 hours and almost 15 years to get here. Standing slack-mouthed in the centre of Piazza Grande, I rotate 360 degrees to gape at this arrestingly beautiful sloping piazza of medieval houses, Gothic and Renaissance palazzi, a multi-arched loggia and, the pièce de resistance, the rounded wedding-cake-like apse of the church of Santa Maria della Pieve. Mentally, I kick myself for not having thought to escape the maddening crowds of Florence, San Gimignano and Siena years before. This oversight on my part is especially reprehensible given that Arezzo lies only one hour east by train from Florence or 1 1/2 hours by bus from Siena, two cities where I have lived and studied. Like most visitors to this compact regional capital, I was drawn here by the inspired fresco cycle of The Legend of the True Cross by Renaissance painter Piero della Francesca. The fresco sequence, located in the Cappella Maggiore in the Basilica di San Francesco, tells the story of how the wood from the Garden of Eden became the cross on which Jesus was crucified. The frescoes, some of which stand more than 12 metres above the floor, represent della Francesca’s largest work and are considered an early Renaissance masterpiece. 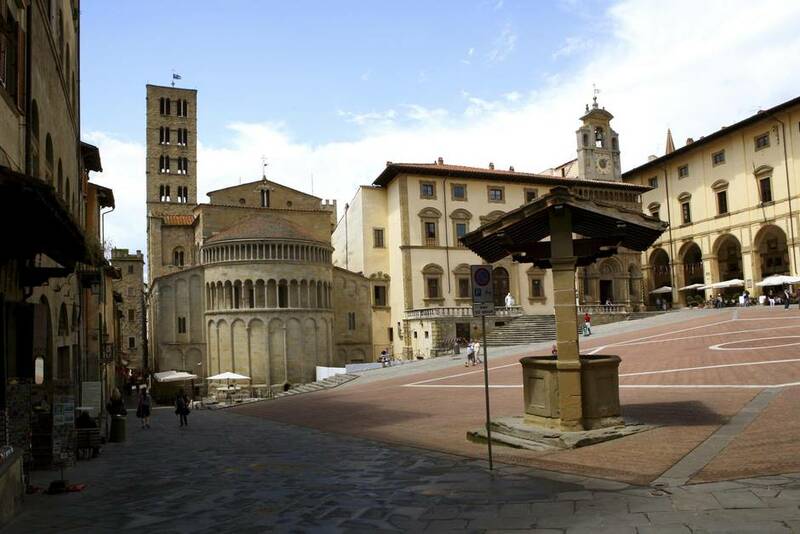 Yet it was not long after exiting the basilica that I became enchanted with Arezzo itself, an attraction in its own right. 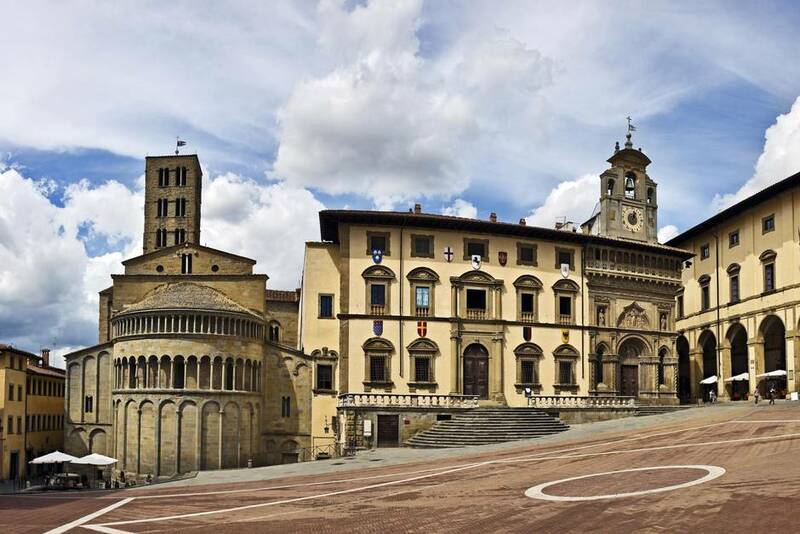 It quickly became apparent why Italian actor and filmmaker Roberto Benigni, who took away three Oscars in 1998 for his family love story Life Is Beautiful, shot his movie here in the historic centre of Arezzo, a compact and atmospheric diamond in the rough, rich in art and architecture. So proud of Benigni is Arezzo that in the centro storico (historic centre) you can’t help but run into posters with images of scenes from the movie superimposed over a map, thereby allowing tourists to orient themselves in relation to its film sets. Now, on this particular Saturday morning in early July, the Piazza Grande is jammed with antique paintings and armoires, and the hilly surrounding streets spill over with stalls selling everything from vintage clothing to tarnished silver candlesticks and from chipped crystal and ceramic pitchers to exquisite lire banknotes. From a vendor, I soon learn that I’ve arrived during the monthly antiques fair, a popular event that’s been attracting bargain hunters and connoisseurs since 1968. Adding to the air of festivity, the façades of the Piazza Grande’s palazzi are festooned with colourful crests for the biannual Giostra del Saracino, the Joust of the Saracen, when the town’s inhabitants don medieval costume and the main square is transformed into a jousting track. It’s a shame I’m too late by a week, but even outside of the Giostra and the antiques fair, the Piazza Grande, while perhaps a little pricier than other areas, is an ideal spot for people watching from a piazza-side restaurant or café terrace. From the square, I wander up the cobblestone alleys and side streets toward the ruins of the Medici fortress. Along the way, I’m reminded of Siena and its narrow streets shadowed by tall, sandstone-hued buildings, but, amazingly for Tuscany, without the tourist hordes. Even in July, though the city buzzes with open air markets, weddings, baptisms and concerts, and the restaurant terraces spilling out into the streets, it’s mostly locals and other Italians. Approaching the Prato Park, by the fortress, I spy a newly married couple I had photographed earlier in front of the church of the Badia delle Sante Flora e Lucilla, where Roberto Benigni falls off his bicycle on top of his principessa, his princess, in Life is Beautiful. Now, the newlyweds are wrapping up their photo shoot in the park and heading back to their Beetle. The park is cool and verdant, a welcome reprieve from the intense heat. It’s an urban park, but if you stand on the old fortress walls, you can see out to agricultural fields and the rolling green hills of the surrounding Aretino countryside. Back in the historic centre, I’m drawn to the boutiques, the charming little pastry and gelato shops, the town’s iconic Caffè dei Constanti, opened in 1804, and particularly to the fragrant delicatessen store and upstairs restaurant of Gastronimia Il Cervo. 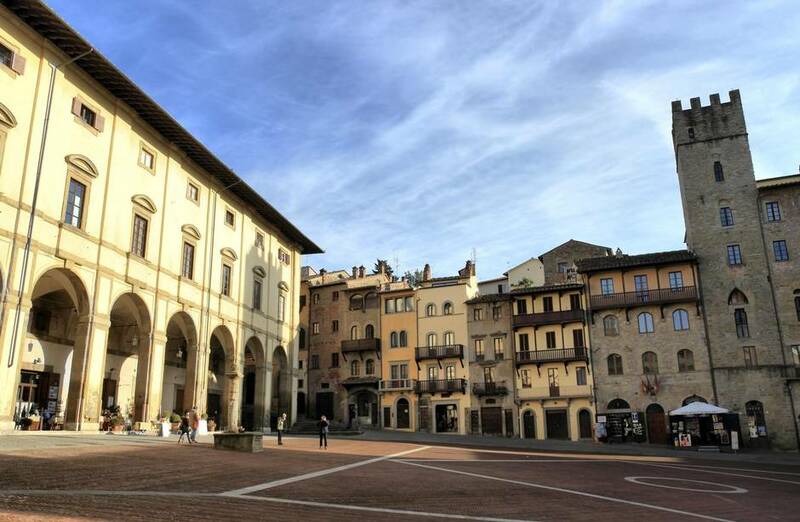 Aside from its art and beauty and easy access to the Aretino countryside, what I love most about Arezzo is its relaxed joie de vivre. Locals here are affable and at ease in a way that residents of the tourist-heavy Tuscan cities of Siena and Florence are too harried to be. One such resident is Mario De Filipis, whose family operates La Buca di Francesco and who welcomes dogs in his restaurant. He invites me inside to view the frescoes and his collection of antique books, despite knowing I would not be dining there. Afterward, I head back to my hotel regretting that I cannot stay in Arezzo a third night. I know where I’ll next be taking Italian language and culture courses. It may have taken me 3 1/2 hours from Pienza by bus and almost 15 years to get to here, but I’m so glad I’ve finally come, for life in Arezzo is indeed beautiful. Reservations for San Francesco’s Bacci Chapel, or Cappella Maggiore (Piazza San Francesco 4; 011 39 (0)575 352727; pierodellafrancesca-ticketoffice.it/en/), are compulsory as they will only allow 25 people in at one time. Admission is €8 ($11.60) for a 30-minute viewing. Opening hours in summer: Monday-Friday: 9 a.m. to 7 p.m.; Saturday: 9 a.m. to 6 p.m.; Sunday: 1 p.m. to 6 p.m. The Giostra del Saracino takes place this year on June 18 and Sept. 4. The Antiques Fair is held the first weekend of every month. Ideally located across from Basilica di San Francesco, the four-star Graziella Patio Hotel (Via Cavour 23 ; 011 39 (0)575 401962; hotelpatio.it) has 10 rooms, each named after and inspired by locations visited by legendary travel writer Bruce Chatwin. Double rooms start at $150. Wallet-friendly boutique hotel B&B Antiche Mura (Piaggia di Murello, 35; 011 39 (0)575 20410; antichemura.info) is housed in a 13th-century palazzo and features stylish yet simple rooms named after “goddesses,” real and fictional, such as Artemisia, Holly Golightly and Marilyn Monroe. Doubles start at $86. Five kilometres outside Arezzo, the Badia di Pomaio (Localita Pomaio 4, Via delle Conserve; 011 39 (0)575 353210; hotelbadiadipomaio.it) is a tastefully restored abbey with 17 rooms and an outdoor pool in the hills above Arezzo. Doubles start at $172. Housed in a 19th-century pharmacy, Gastronomia Il Cervo’s (Via Cavour 38; 011 39 (0)575 20872) decor has retained the pastel-hued wood-panelled walls of an old-fashioned apothecary shop. Friendly owner Vittorio’s Tuscan and Aretino menu varies daily. Taking its name from the Basilica San Francesco, La Buca di San Francesco (Via San Francesco, 1; 011 39 (0)575 23271; bucadisanfrancesco.it) is located in an adjacent palazzo that once was part of the basilica. Opened in 1929 as a restaurant, its low ceilings and arched walls feature frescoes dating from the 13th century and the floors once formed part of an ancient Etruscan road. Today the restaurant is operated by the De Filippis family, who take pride in preparing traditional Tuscan and Aretino dishes. For Tuscan cooking in a chic Scandi setting, try Le Chiavi d’Oro (Piazza San Francesco 7; 011 39 (0)575 403313; ristorantelechiavidoro.it).